The cruise companies’ representatives responsible for hiring new employees visit different countries and hold job interviews with the candidates for work on the ships. Before the job interview the company informs the agency about work positions needed and position requirements. A particular work position complies with specific requirements and company standards. It is always useful to discuss the position you apply for with the agency. If the applicant is successful at the job interview the new employee is expected to join the ship within 1 to 6 months (sometimes waiting period can be longer). 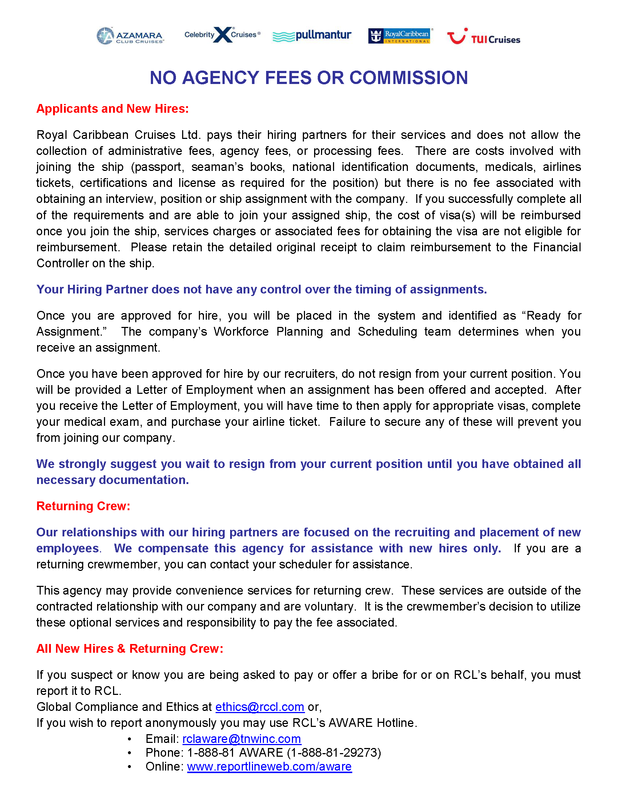 The Agency receives the Letter of Employment of the newly hired employee with the ship assignment. Almost always new employees cover all of the first-time-joining-the-ship expenses. The total amount of joining expenses may reach 1000-1500 Euro including traveling expenses, physical examination, visa, any marine safety certificates (if required). More information about estimated expenses will be available once it is clear which cruise company in particular you will be applying. Note that you do not pay an employment fee to our Agency. There can not be any charge for job interview or job offer payable to us or to any third parties. Cruise companies outline their Fees Policy according to the International Maritime Conventions (MLC2006) stressing that there should be no fees charged to obtain a job. *You may need to get certain services that are not directly connected with obtaining employment but can help you to meet the requirments and successfully get needed documents. Such services are for example translations, typing, visa expediate service, assistance in obtaining documents, mailing services, English language courses, trainings on successful job interview, professional training etc. All additional services that we provide are available in our price list that we distribute to each applicant signing service agreement with our Agency. Note that such services must be voluntarely obtained. Thus we encourage our applicants to discuss the fees and expenses with us if any questions and report to us when any payments are due to third parties in exchange for employment. 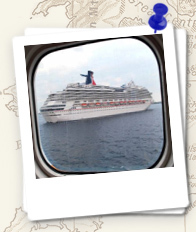 The cruise companies sign crew agreement with each employee either before joining the ship or on board the ship. In compliance with the assigned position, the agreement outlines the employee’s salary, contract and vacation lengths. The contract usually lasts six to nine months and follows by six to ten weeks of vacation. Health insurance subject is also specified in the seafarer’s agreement. The cruise company covers all medical expenses for the employee, if he/she gets sick or injured during the contract.